GCM games are run differently than the KS battles. Their's are quick 90 minutes fights run daily. As such, the emphasis is on the combat itself, so using the point system makes sense. KS games, which are 3 hours long, are usually more about maneuver and accomplishing a mission. These are harder to design so we usually only do 1/week. True, but we are very limited as to what we can do to create more than the usual bash the enemy into submission scenario. MP does not have scripting as SP does. That is a huge limitation on the creation of scenarios. Consequently, convoys and depots play an out-sized role in our battles. What time are we playing today please? The game is set to begin today at 20:00GMT. Those Russian guns were killing us. I had to pull my two batteries back behind the ridge. Martin asked me what I thought our chances were in a frontal attack and I told him it would be grim and most likely futile. The Russian guns would murder my infantry if I advanced. I saw it for quite a while. But I wasn't in command so I waited. I was ready to go forward if ordered. But I really wanted to take my whole division north and get around the Russian right. I said nothing. Then a courier from Martin: "Flank the enemy's right." I was ready, already deployed near the road. So off to the north my whole division (7,000+) marched. We turned east and trampled cross country and soon ran into Russian cavalry. Russian infantry reacted and came north. I knew marching without any cavalry support was going to be painful with all the Russian cavalry about. And it was, very. I left behind at least 4 battalions as sacrificial lambs and lost a few more routed. Luckily, Josh's cavalry caught up and pinned the Russian cavalry at just the right moment, allowing me to get 9 or 10 battalions and all my remaining guns to the high ground around San Luza with only a minute or two to spare. Now facing west, on my right, I stood off a Russian brigade. Russian Infantry closed from the south. I formed a line against them. Thankfully, the Russians didn't manage to get any guns back there. So my guns were able to really pound the poor Russian peasants. Without question, I held because of the guns. I'm not sure I'd have taken a lot more casualties if we'd attacked straight ahead. But it was Avery's first time commanding a division, and it would have been slow developing. Really it came down to being pounded by the Russian guns or hounded by the Russian cavalry. An interesting game. I felt trapped for most of it, with no good choices. Martin came through for me when I needed him too. That brigade was something like 3 miles from me. I sent them there to anchor the flank. I was riding back, and I could hear the cannister round and see the casualty toll the poor fellows were taking. Mark did a good job for us yesterday. In the early part of the game we lost a lot of men to Russian long range artillery fire without doing much damage at all in return. I felt the Russian army was quite widely spread at this point, and was planning a major attack SE from Perues to rupture it, using about 13,000 men - or 2/3rds of the corps. But our own guns were definitely getting the worst of things, and when Mark expressed his reservations, I decided to just shift to the N and try and attack where the guns weren’t. We gained the objective, but still lost more men than the Russkies though. I have asked Kevin if he has stats for the proportion of our casualties caused by the Russian guns? Excellent game, and both teams fought hard and with great credit. Mark definitely carried the water for us yesterday. My day was mostly spent staring down Russians on our right and exchanging artillery shots. That is, until the moment the order arrived to move around to the north and east. Although I had a bad feeling about it (I knew the Russians to my front would be able to move much more quickly in response to my move using their interior lines), I knew it was necessary -- so Morand girded his loins and took one for the team. Sure enough, significantly before I was able to bring my long, bedraggled column into position, the Russians had guns on the heights overlooking my caravan and really pounded them. I haven't looked at the numbers, but I'd be surprised if this caused less than 60-70% of my overall casualties for the day. This was a great battle, everything considered, and had all the typical features: high drama; good play and much confusion. Martin did a great job as C-in-C as well, keeping us all on the same page. It was a scenario that must have been very difficult for CinC's to command troops -- so I sympathize with both Pepe and Martin. Nicely done. coming back to the replay I am a bit surprised what was going on down south - since there were no enemies there I believe? This scenario was designed to give the CinCs a real challenge. Neither side has adequate resources to accomplish everything it needs to do. The French were forced to abandon their superb defensive ground and fight the Russians on the flat, open valley floor. The Russians were forced into a defensive battle, but since they had a large line to defend, could not concentrate early in the battle. They were given a large number of guns to compensate and also prevent the French from using Mark's patented phalanx attack into the middle. The French would have to maneuver to win. Cavalry on both sides was beefed up. The open ground on this map was a perfect hunting area for these vultures. I think this is the first scenario I've designed where the battle developed as I had anticipated. The CinC's cooperation in this matter is greatly appreciated. The French concentrated their entire force and attacked the Russian right flank. Their goal was to break through the Russian line and capture the line of communication. This had the effect of uncovering their own LOC which the Russians took full advantage. The Russians voluntarily gave up battlefield equality and sent two brigades west to break the French supply line hoping that what remained could stave off the French attack. These actions resulted in two separate battles being fought. One taking place around Punhete was a desperate Russian stand to stem the hoards of Frenchmen moving west. 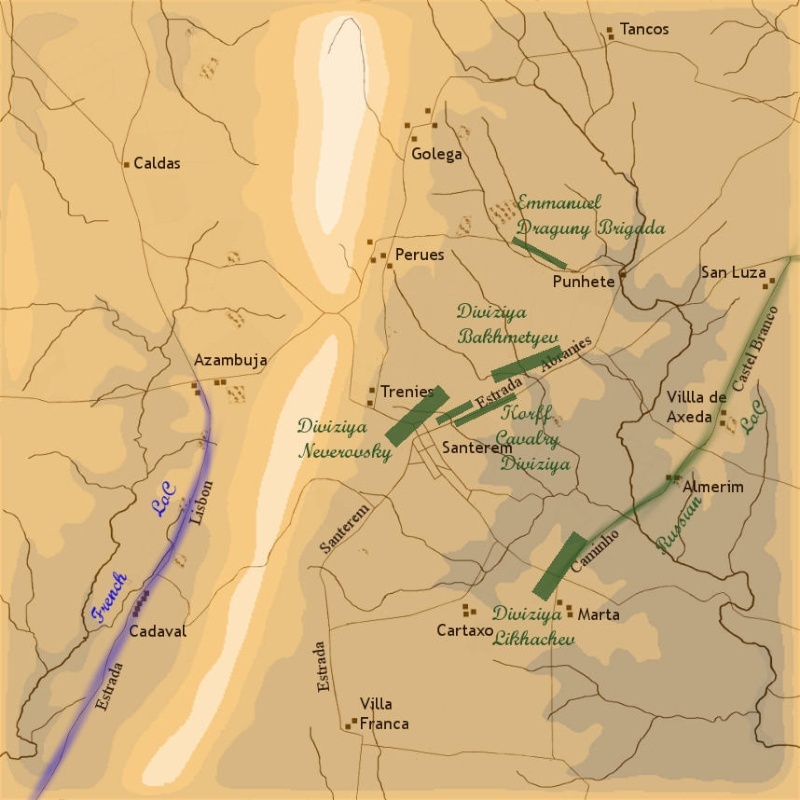 The second was fought around San Luza. The French troops that managed to bypass the fight at Punhete were engaged by Russians sent to protect the LOC. The battle ended with the French firmly astride the Russian LOC. The Russians also broke the French LOC, but voluntarily withdrew, presumably to come back east to help their fellow soldiers. The French took horrendous casualties, 42% while the Russians suffered 29%. Russians don't care about casualties. Serfs are cheap. All in all, it was a great battle, one of the most intense I've been in. Was it a draw? The Russians were still - just - contesting the French division at San Luza when we ended things - and both French and Russians were sending their heavy cavalry divisions east to help out. I don't trust the Machiavellian side of Kevin as scenario designer. So I was working under the objective of getting 1,200 men to the enemy's LOC and stay unopposed for a while, not to hold there. I should have made clear that point beforehand. I was also surprised when I watched the reply and saw so many frenchies facing our 2 divisions engaged in the north, but during the game it wasn't that way. I got an estimate of at least one and a half divisions, but can't remember in what stage of the game. For this game I would have liked to have just a small force to command and play with 3 divisional commanders for the infantry and 2 brigade commanders for cavalry, but then you have to play with the people that shows up. And then my big blunder during the game. EJ was moving west uphill on the southern road, immediately the French troops on top of the ridge started to move, they headed north but from my position it looked like if some of them were moving west, like going to attack EJ on their LOC. I had sent Morsey northeast and was moving my division in the same direction, and decided to go west with a brigade to support EJ and take the guns with me for safety. When I advanced and met EJ's brigade around Azambuja. All the Russians field commaders did a great job, superb in the north. Sorry to EJ that didn't get a chance to kick French asses. At best it was a draw for the French. The Russians easily cut our loc and the French took massive casualties to get across the Russian loc. 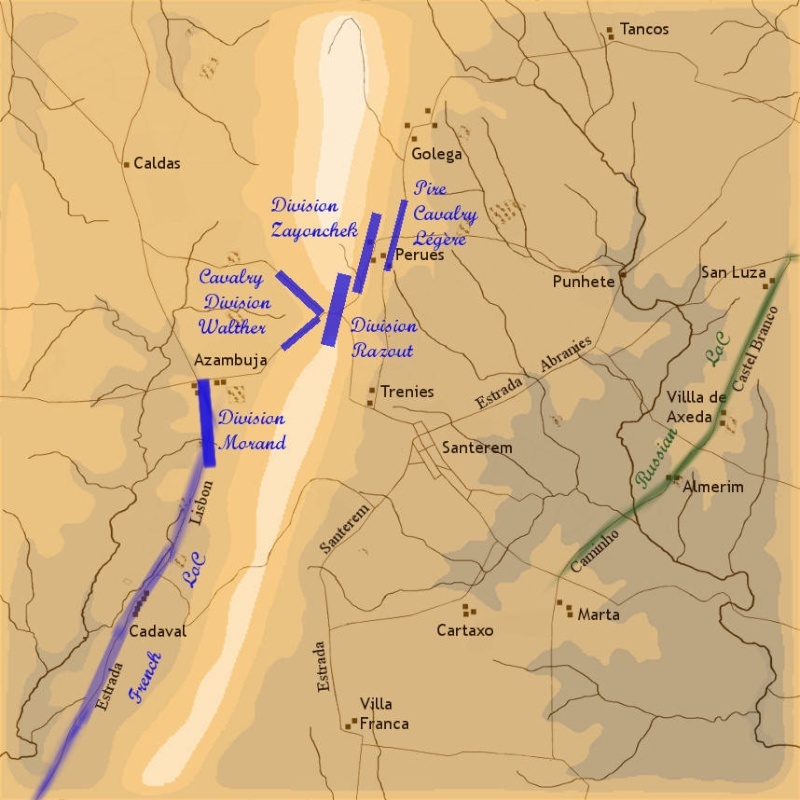 I had more than enough men who were not engaged at San Luza, but all in all, I'd think the Russians were pretty happy about how the battle went, except for EJ's brigade wandering off the objective and illegally climbing the ridge for no apparent reason other than boredom.